Historical Placard – Chesapeake Chapter U.S.L.H.S. 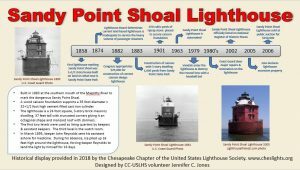 The Fishing Battery Lighthouse indoor placard was presented on January 26, 2019. 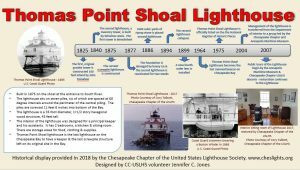 It is to be displayed in the Keeper’s House at Concord Point Lighthouse, Havre de Grace, Maryland. 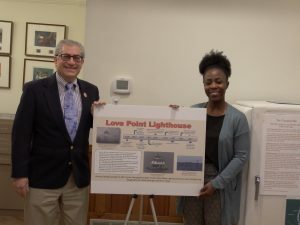 Jessica LaPota, Executive Director at Concord Point Lighthouse accepting the Fishing Battery Lighthouse timeline placard from chapter member Greg Krawczyk on January 26, 2019. 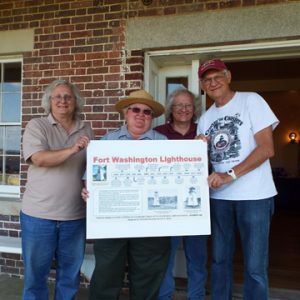 The Fort Washington Lighthouse indoor placard was presented on September 29, 2018. It is to be displayed in the Visitors Center at Fort Washington, Maryland. 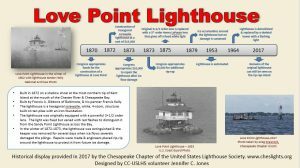 The Thomas Point Lighthouse indoor placard was presented on October 6, 2018. It is to be displayed at the Annapolis Maritime Museum in Annapolis, Maryland. Annapolis Maritime Museum curator, Caitlin Swaim. Photograph by Karl Talbott.